Only 1 left in stock (more on the way). Ships from and sold by Amazon.com. Gift-wrap available. Item arrives in packaging that reveals what’s inside and can’t be hidden. If this is a gift, consider shipping to a different address. 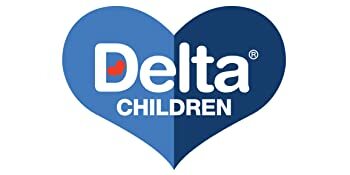 Delta Children was founded around the idea of making safe, high-quality cribs affordable for all families. We design and manufacture a wide range of furniture products for the early childhood years—and beyond, providing children with safe places to sleep, play and explore. 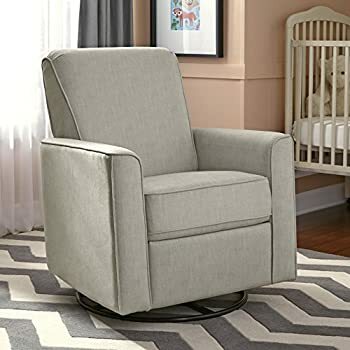 Perfect for feeding, reading or bonding with baby, the Avery Glider Chair by Delta Children makes an elegant addition to any room in your house. 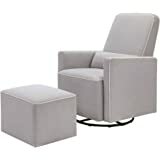 Its refined design will easily coordinate with your home décor and the super-soft, cushioned fabric with high back and padded armrests will surround you in supreme comfort. 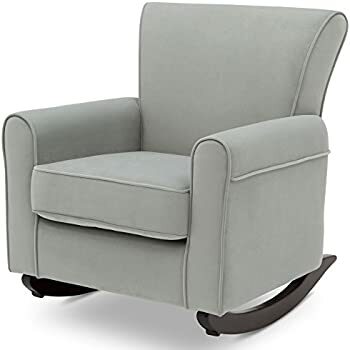 Excelling in both style and function, this glider features a hidden metal gliding mechanism that creates gentle gliding movements, instantly bringing a calming ambiance to any room. 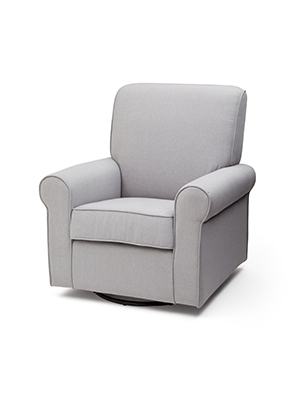 Offering the ultimate in comfort to tired babies and parents, this glider chair is outfitted in plush, cushioned fabric with a supportive, high back and padded armrests. 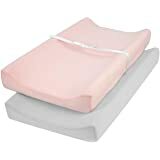 Ideal for relaxing, feeding or bonding with baby, a hidden metal gliding mechanism creates soothing gliding movements, to help send baby gently to sleep. 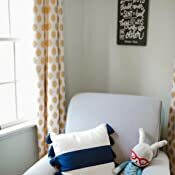 The clean lines and streamlined silhouette make a timelessly elegant addition to baby's space, easily coordinating with any room decor in your house, after baby's nursery days are over. 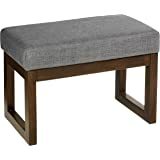 The thoughtful, quality construction features a sturdy hardwood frame designed to withstand years of use. 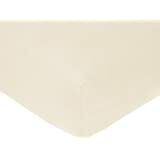 The durable fabric is easy to clean for fuss-free maintenance. 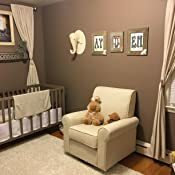 A variety of stylish finishes add a fashionable touch to baby's space or any living space in your home, instantly creating a comforting and serene atmosphere. 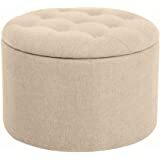 A perfect complement to your glider, rest your feet in style and supreme comfort on this beautiful ottoman. Available in coordinating colors. 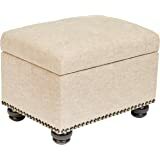 A beautiful accent piece for any room with a round tabletop and pullout shelf, perfect next to your nursery glider, sofa, living room chair or bed. Available in coordinating colors. 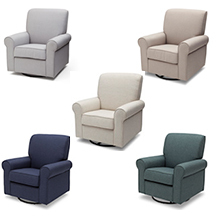 Perfectly plush, the Avery upholstered glider features a simple, timeless silhouette, a supportive back, padded armrests and a durable wood frame. 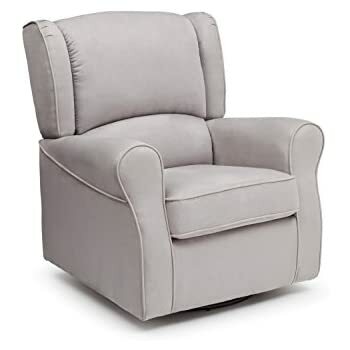 Finished in a durable, easy-to-clean fabric, this gorgeous glider is built with a hidden metal gliding mechanism for smooth and long-lasting comfort that instantly makes any room in the house relaxing-not just the nursery. 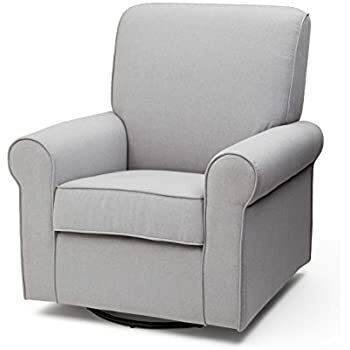 This chair is still really comfortable but after actually having the baby and trying to rock him in it, I have discovered that it is impossible. It squeaks so much! It also squeaks every time I get up to put my sleeping baby in his crib. I hold my breath every time because I’m so nervous he is going to wake up. 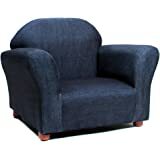 Still gets 4 stars because it looks great and is comfortable but it is so not functional as a rocker. 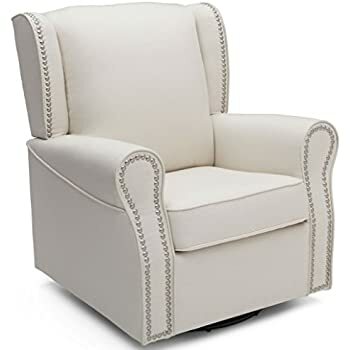 Original review: This chair is the perfect addition to my son's nursery. 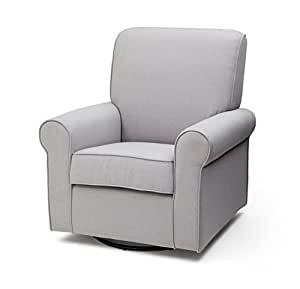 For my first child, we bought a chair that was twice the price of this one. For my second, we decided to get cheaper versions of everything. 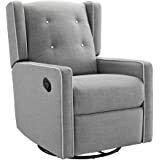 While I have been disappointed with some of the other purchases I have made for him, I was pleasantly surprised by this chair. We like it better than the one we paid twice as much for. I love that the base stays in place when you rock. 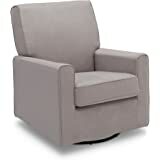 I also love that you can swivel side to side and back and forth. 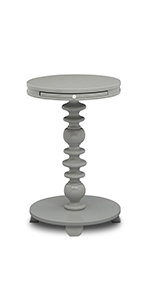 The gray color is the perfect neutral and is what I expected from the color. The back is a little more upright than I would have liked, but the seat is big enough that I still have enough room to position myself for nursing. 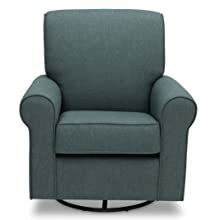 I highly recommend this chair! The chair looks perfect in our nursery and is really comfortable. 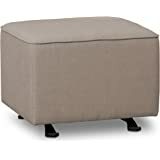 I bought this from the Amazon Warehouse and got a huge discount on it. It came in a beat up box but the chair itself was in perfect condition. I'm super happy with this purchase and would definitely buy it again. The only thing I will say is that it probably wouldn't be suitable for larger people. 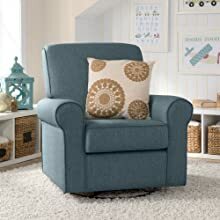 I'm 5'6" and about 150lbs (pre-pregnancy) and the chair is perfect but if I use a pillow behind me it pushes me to the edge of the seat, so not a lot of wiggle room for someone who's bigger. I had it for about 20 days before I returned it. 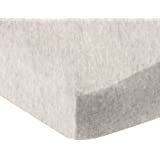 The material is extremely itchy, it tips forward as mentioned by others, and it makes your back hurt. 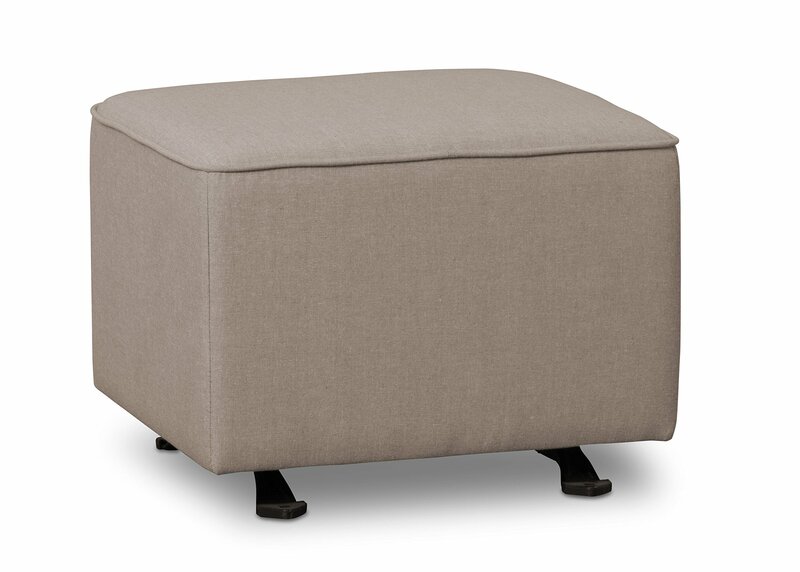 I bought this with the Ottoman that goes with it and it was a nightmare. 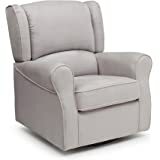 Do yourself a favor and buy the Baby Relax Mikayla on here which I did so myself you won't regret it!. 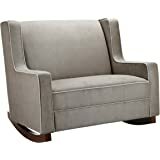 Love the color and look of this chair but the cons outweighed the pros. 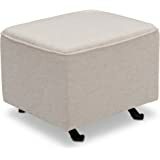 I am 5' 7" and my husband is 6' and for both of us, the seat is not deep enough and the back of his knees did not touch the cushion. 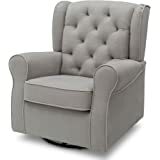 Also, when sitting on the rocker, it falls forward rather than tending to lean backwards as you would expect. This required us to keep both feet firmly on the ground to prevent from tipping forward. 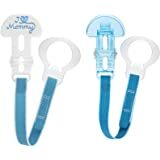 Ultimately we didn't feel this would be a safe option for our use with our baby on the way and chose to return it. 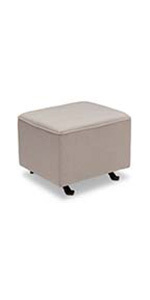 It comes in a box with three pieces (back of chair, bottom cushion, and bottom of chair). Decently easy to assemble, but was a little difficult to get hooks on the back of the chair aligned with the bottom latches. So far so good. 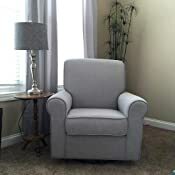 We have not used with baby yet, but it looks fantastic in the nursery. 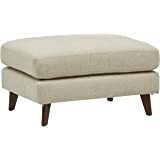 I think it would be best used with a small ottoman and a nursing pillow. 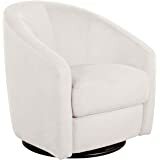 Like this chair, it sits firm it is however significantly lighter in color than the picture. Came with a lot of broken styrofoam packaging too. 4.0 out of 5 starsGreat for nursery. 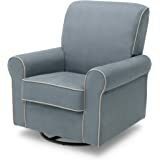 Very nice and comfortable but no head rest Great for rocking a baby. 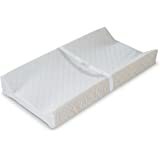 5.0 out of 5 starsThis will complete your nursery guaranteed! 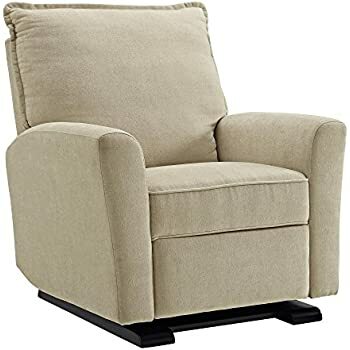 I have had this chair for 2 years now and am still in love with it. 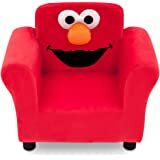 It’s the cutest chair for a nursery. Way cuter than your average glider. Also more pricey than a glider, but well worth the money. Love!